Hyderabad: The chairman of the Nagarjuna group, K.S. Raju, and chief executive officer of Maytas Infra Ltd, P.K. 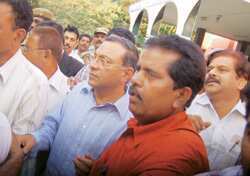 Madhav, were on Tuesday sent to 14 days of judicial custody by a city magistrate at Nampally court here. The two executives were arrested on Monday following charges that Nagarjuna Finance Ltd has failed to return depositors some Rs100 crore. The police said on Monday that the duo were arrested under section 5 of the Andhra Pradesh Protection of Depositors of Financial Establishments Act and under sections 420 and 406 of the Indian Penal Code. Madhav was for nearly two decades finance director on the board of Nagarjuna Fertilizers and Chemicals Ltd during 1982-2001. Before joining Maytas Infra as its chief executive, he was director and lead partner at Byrraju Foundation for four years. The magistrate rejected Raju’s plea for bail on medical grounds and ordered the police to provide the necessary medical examination and services to him at the Chanchalguda Central Prison. A spokesperson of Nagarjuna group said the group is moving a bail petition and expects to obtain bail on Wednesday. “We have submitted the medical reports of Raju to the court but it wanted examinations to be conducted by government doctors," he said. Raju has for the past five years been fighting lawsuits filed against him by the ministry of corporate affairs through the Registrar of Companies, which moved the economic offences court against him and other directors responsible for raising public deposits that were not returned.